I flew to San Jose this weekend to visit a candy store. 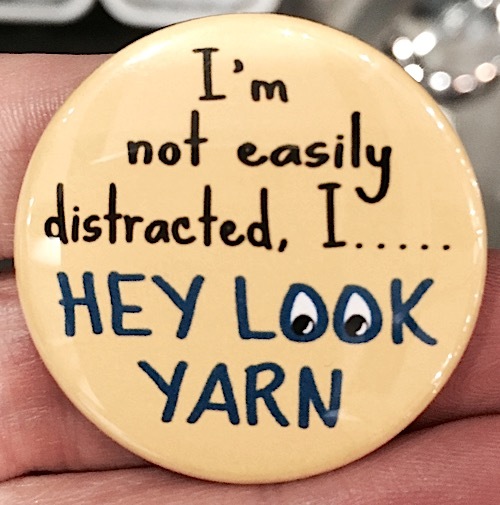 Not one filled with sugar, but with something better… yarn. 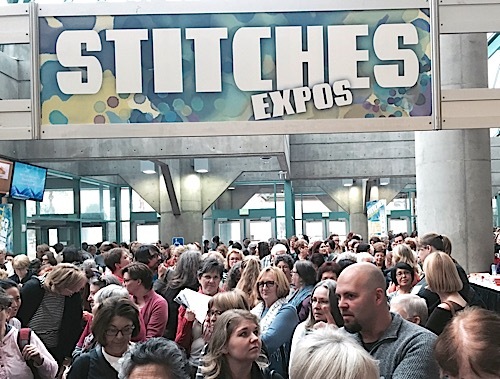 Stitches West is one of, if not the largest knitting show in the country and it’s pure bliss for us knitters. Here you find fascinating people, yarn artists, popular knitting stores, authors, designers, gadgets and more. Since I’ve moved to the San Diego area, I haven’t been able to go as often as I’d like (every year) but I did remember that Fridays are the least crowded and my favorite day to go. See that photo from the front? Yes, that means I was one of the first in line. I had only one day and wanted to get the most from it. It’s difficult to decide where to go first and to limit oneself to ‘reasonable’ purchases. 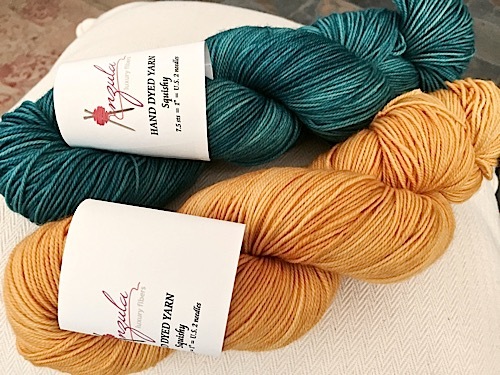 I started way in the back and planned on walking the entire floor before buying anything but gave up in only the third booth when I saw the sample projects knit with this yarn. I sometimes struggle finding a cotton I like to knit with, especially one that’s machine washable. 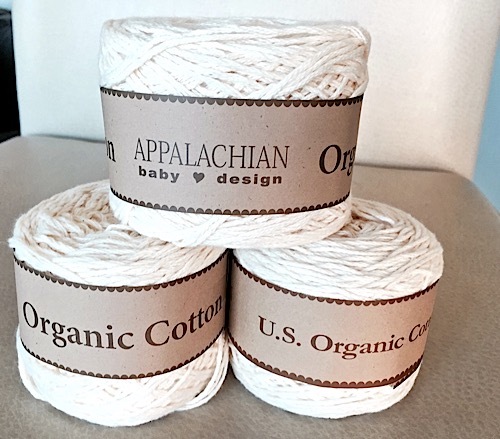 This sport-weight yarn feels lovely and is made in the USA with organic cotton grown in Texas and milled in West Virginia, giving jobs to local families. The clear stitch definition is perfect for the Showy Decrease. It is destined to be a baby blanket I had already swatched and charted. Can’t wait to get started. And then comes the ‘I have no control over my impulses when I hold beautiful, luxurious yarn’ part of the day. The Anzula booths were one of the most colorfully striking areas in the show. They have 14 yarns of different weights and composition and 98 (yes, 98) colorways. While not all colors were at the show, there were at least 40 to choose from in a variety of yarns. For example, they brought five shades of golden yellow each just slightly different than the one next to it. I found myself standing smack in the middle of the isle, dreaming of gradient designs while others were forced to shuffle around me. I literally picked up and put back yarn for six different projects that were floating in and out of my head before deciding (35 minutes later) on these bright San Diego summer colors. Think soft sunsets over deep blue water to help you chase away those harsh winter blues. This Squishy yarn is 80% Merino, 10% cashmere and 10% nylon, incredibly soft to the touch and the colors are vibrant! This one will take a little more time before it tells me exactly what it wants to be. Did you go to Stitches? If any of you have been to this or the other Stitches shows around the country, I’d love to hear about your favorite things. P.S. Did I forget to mention the beautiful sari silk scarf I bought and the handmade fabric tote to carry all the yarn home? Oh, and those cute little scissors and 8″ Addi circular needles …. yikes. 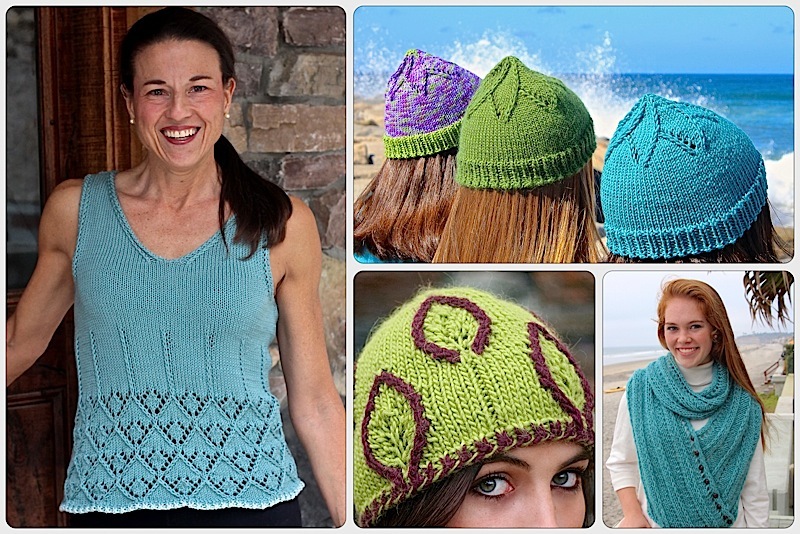 This entry was posted on February 23, 2015 by Laura Cunitz in General, Yarn & Yarn Shops and tagged Anzula, Appalachian Baby Yarn, Stitches West.